Nestor, a blue alien with a baseball hat, is not just any puppet: “He” was created by a professional puppeteer for 29-year-old Tim Kubart and cost $1,500. 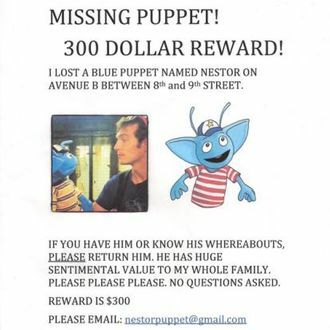 Kubart, who plays in a band for children, dropped Nestor in the East Village and really wants him back. “HE HAS HUGE SENTIMENTAL VALUE TO MY WHOLE FAMILY,” the missing-puppet sign says. “PLEASE PLEASE PLEASE.” Kubart told DNAinfo, “I do feel like I have a relationship with the puppet because I am the one controlling him. I have spoken with him so many times and I feel like he has a personality and now that is gone.” The puppet has a Gmail address if you know anything.